The money transfer pioneer is swiftly moving into the digital age. In the lobby of Western Union’s bright San Francisco office is a fanciful sculpture composed of hundreds of wooden arrows that ribbon their way across the ceiling. It’s an appropriate metaphor for the 164-year-young communications pioneer, which once dashed telegrams across America, and is moving swiftly to reinvent itself as a leader in digital money transfer across the globe. Sometimes, arrows just come with the territory. Western Union built a reputation as a way to move money quickly and reliably to other countries, with funds often sent by immigrants to the family they left behind. Mostly that meant customers coming into agent locations and filling out a form to send money. The pioneer of the telegraph is already a global leader in cross-border payments, handling more than $80 billion in consumer money transfer transactions in 2015 to more than 200 countries and territories, from Albania to Zimbabwe. This represented more than 260 million global consumer-to-consumer money transfers, typically moving a few hundred dollars to friends and family. 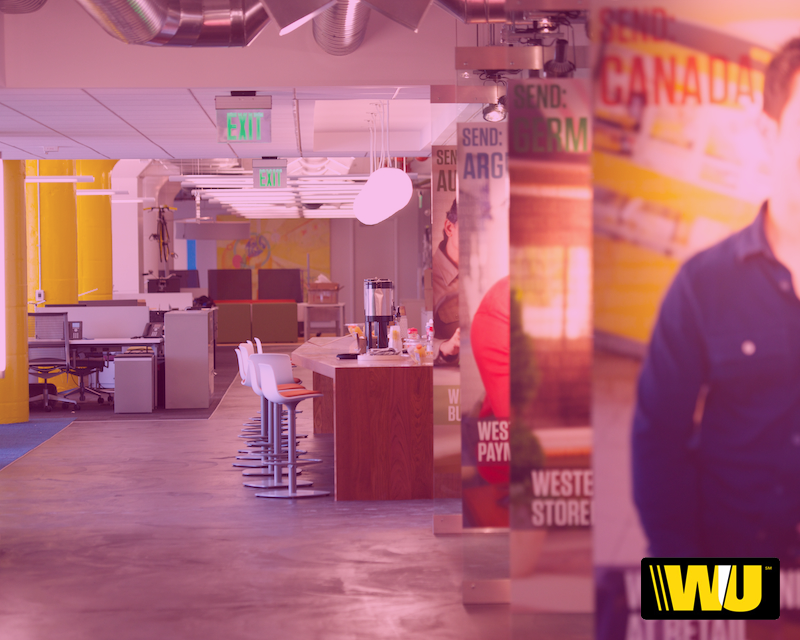 Now, Western Union is transforming quickly to adapt to the latest generational and technology advances. People are on the go more than ever, using mobile devices and social media to keep in touch, consume information and run their lives. Global smartphone penetration by population is expected to exceed 50% by 2017, and one third of millennials believe that within the next five years they will not even need a bank, according to a 2015 report by McKinsey & Co. But the business of money and how it moves has not kept pace with changing consumer behavior. Western Union executives see opportunity in adjusting to these shifts. Under CEO Hikmet Ersek, the company believes it can maintain its leadership in the cross border money movement through adopting a ubiquitous approach that connects the physical and digital worlds, one which builds on the company’s core strengths as a global leader and trusted money transfer company, while extending the availability and convenience of its services through a suite of digital products and initiatives. A cornerstone of that effort is WU Connect, an integrated platform that allows users to send money via social and mobile networks through a suite of open application programming interfaces (APIs) that connect Western Union's technology with third parties. Through participating third-parties, consumers can use their debit card, credit card or bank account to send funds from the U.S. through a variety of payout options including retail agent locations around the world, or to a mobile wallet or bank account, where available. For third-party vendors, it’s a seamless way to plug their apps into Western Union’s powerful foreign exchange conversion, data management, regulatory, compliance, and anti-money laundering capabilities, without the costly and time-consuming effort of creating them in-house. So far, the strategy has proven fruitful, as Western Union has recently announced it has teamed up with mobile messaging companies like Viber and WeChat. For Western Union, these agreements and similar “white label” licensing deals are being explored —wherein its technology is integrated into a reseller’s existing product or service — not only to introduce a new method of money transfer for their existing customer base, but they quickly multiply potential new customers. WeChat has 680 million active users; Viber has 275 million. Both deals could make Western Union essential to the online lives of newly connected customers in emerging markets such as China and India as they remain in touch with loved ones in the United States. Western Union is also focusing on reaching new customers in other ways, not just through their mobile devices. A big push now is to bring technology more into retail agent locations and other digital experiences. In 2014, for instance, the company announced services that allow customers to pay bills and transfer money at self-service kiosks in thousands of U.S. Walgreens stores linked to Western Union’s network. In most agent locations, the Western Union experience is still largely manual, with the majority of its customers filling out print forms while standing in line. That has to change, say executives. "There are very high traffic areas in many countries and at large retail agents like Walgreens, for instance, where we can cut that 45 minutes standing in line down to a few minutes by letting them start transaction on self-service digital kiosks and then finish the transaction at a regular checkout counter at the retail," says Saraf. Besides Walgreens, Western Union has also launched kiosks at major retailers such as WH Smith in UK, and FranPrix in France. These moves are designed to change the perception of Western Union. “We’re shifting the perception, from Western Union as a network of agent locations, to an omni-channel platform that happens to have an asset that is an incredible global network,” says Khalid Fellahi, vice president and general manager for Western Union digital. When you get under the hood of Western Union, its power becomes apparent. The company operates a sophisticated international agent network that navigates a labyrinth of global financial regulations and limitations. It works in 130 currencies and more than 200 countries and territories, to provide a convenient and reliable banking network that many financial service companies can’t match and which social networks and messaging companies would find hard to build from scratch. "There’s a very high barrier to entry for cross-border money transfer," says Thompson. "The real advantage is that this is our core competency at Western Union." Early indications show that the new digital strategy is working. In the US, more than half of their customer transactions are executed via mobile devices. WU.com consumer money transfer transactions increased 26% in 2015. The engine powering the company’s transformation strategy is ‘WU Labs’ in San Francisco’s South of Market neighborhood, a bustling area that resembles a 24-hour construction site. Neighbors include Dropbox, Twitter, Uber; the San Francisco Giants play down the block. The 26,000-square-foot office, designed by the stylish local Fennie + Mehl Architects, reflects Western Union’s brand: it has a clean and bright look, with plenty of open space for expansion. It’s a busy place filled with more than 300 employees, both full-time and contractors. In open and glass-walled rooms, developers are coding away to develop the next generation of the company’s online payment platform. Past the normal bric-a-brac of the modern Silicon Valley office – the free food and foosball and treadmill desks – lies some serious work. Some of the most important jobs are done in a non-descript downstairs corner room where engineers use the "scrum" approach to software improvement. It’s an interactive, iterative and flexible strategy built on the agile software development method. The so-called “Scrum Troopers” make improvements in bite-sized chunks, working in three-week focused sprints. In the past year, they have produced more than 150 incremental advancements, on projects that range from user interface enhancements on mobile apps to back-end infrastructure. Previously, they had completed only a handful of updates a year. The team is also paying particular attention to fraud and risk management by leveraging a cutting edge “big data” Hadoop platform – the same technology that is at the foundation of leading digital companies like Facebook, Google, and Yahoo “There are always some bad guys out there that want to take advantage of our ecosystem,” said Saraf. Those changes, and dozens more like them, are designed to make the company’s offerings seem more like the services of a trusted friend. “It’s an image the company cultivates on every level. It is great to see our digital transformation being noticed and we have won the best in class new service for our Digital Self Service Kiosk at the 2015 Corporate Entrepreneur Awards hosted by leading global marketing agency and for being named in the top 25 global Digital transformations by the leading CIO.Com and Computer World publications,” said Saraf. Upstairs at the San Francisco office, for instance, a social media team actively manages the company’s presence on social platforms like Twitter and Facebook. It’s part of the plan to turn the Western Union app into a “conversation platform”, to further connect its users with the essential and life-changing services Western Union Provides.